Today we (Lemon, Arif & Me) released a beta version of MYRUET (http://www.myruet.com). 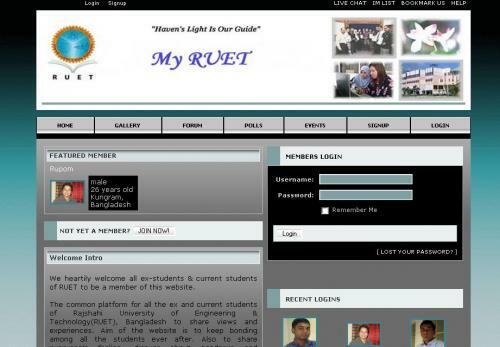 MYRUET is the community website aimed for all ex and current students of Rajshahi University of Engineering & Technology (RUET), Bangladesh. We released this version as a testing version. Upon members’ feedbacks on testing this website, we will change/modify the interface, functionalities & fix bugs. We would like to receive suggestions from the members who joined and tested. We were targetting to launch this community website from many months. But everyone was busy with works. Finally we seated together, managed time and after few days’ hard work we got an initial version to release. We started thinking about this website one year back and booked the domains later. But it took almost one year to prepare a version. Lemon and Arif did a lot on this website. I enjoyed working with them. If you are an ex OR current students of RUET, please join MYRUET and start testing to help us improve the usability & quality of this site. Please feel free to send me your suggestions on the current version. This entry was posted on Sunday, June 24th, 2007 at 2:26 am	and is filed under General, MYRUET, RUET, My Campus, Sharing Experiences. You can follow any responses to this entry through the RSS 2.0 feed. You can skip to the end and leave a response. Pinging is currently not allowed. This theme, Rupom Here, is designed by Rupom(it's a modified version of theme contempt). Rupom Here is Rupom's personal blog. WordPress generated this page with 29 queries, in 0.303 seconds.